Crafter Blue is a new Hong Kong based watch company begun in 2013 by Steve Chan, a Seiko enthusiast. 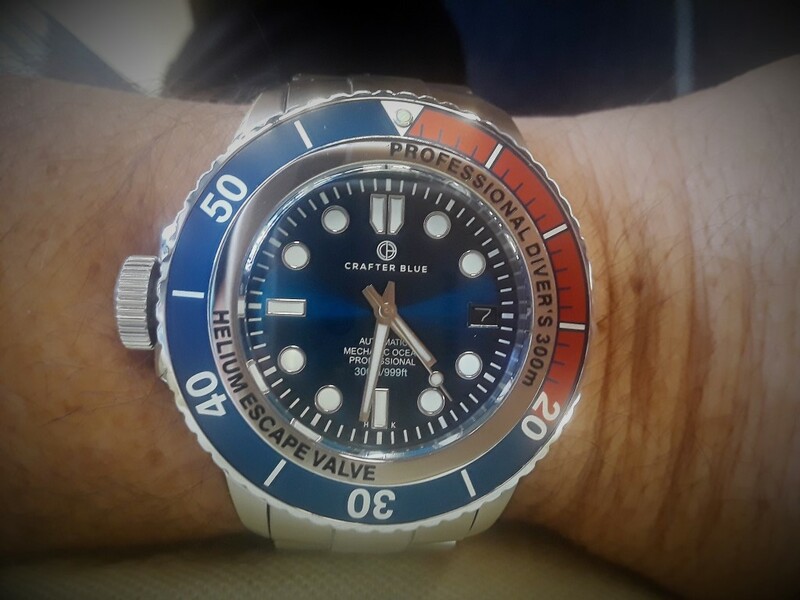 The first product line manufactured by Crafter Blue was and is their high end curved rubber straps, primarily made for various Seiko dive watches. No one else makes vulcanized rubber curved end bicolor rubber straps for these watches. Added to the line for 2018 are Crafter Blue Professional Diver’s Watches in six models. 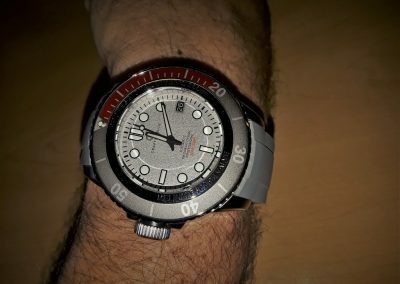 The watches are not a homage to any recognized dive watches on the market, except for hints of some Seiko and Rolex models. Crafter Blue has managed to put together an affordable line of high quality, rugged, dive watches that are very attractive and eye catching. 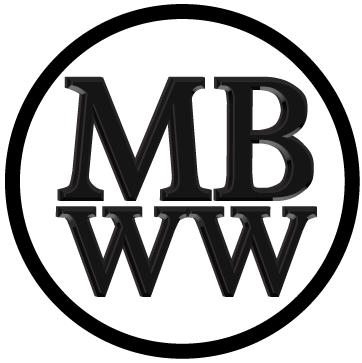 For this review I have two models. The first is the model MOSS002.SB.RB with a Pepsi bezel, blue face and stainless bracelet bracelet. The second is the model MOSS008.O.R, the same basic watch with a gray and orange bicolor vulcanized rubber strap, and matching gray face and orange and gray bezel. Both watches, based on my measurements, are 45mm in diameter by 15.8mm thick, 52mm lug to lug with an unusually stout 10mm in diameter by 3.4mm thick signed, gear edged, o ringed, polished, screw down crown at 9 o’clock. These watches are not petite. In addition, the watches each have a 3 o’clock helium escape valve and a polished and engraved inner bezel that looks great. 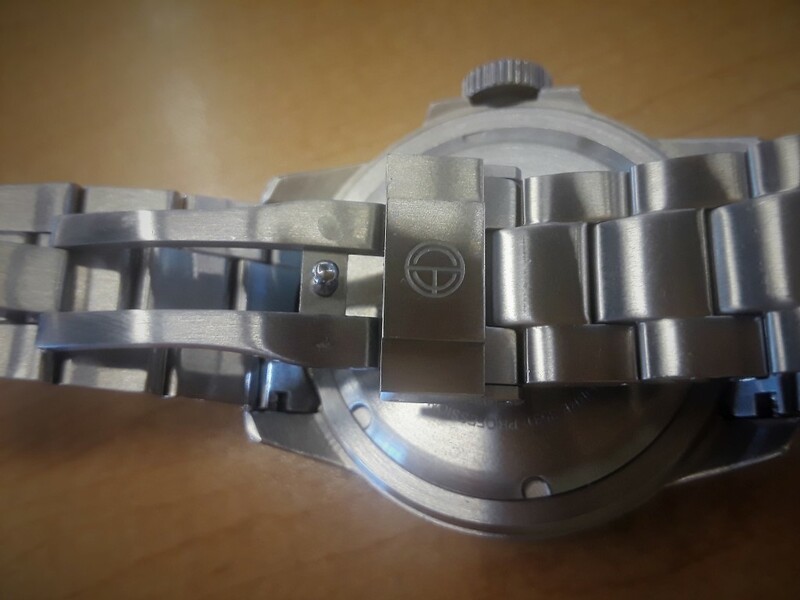 The watches beautifully finished and sculpted, brushed, 316L stainless steel case is polished on the sides of the case (and sides of the SS bracelet) along with the crown and crown guard. It is easy to see how this watch gets a rated 300M water resistance rating. Each watch has a smooth 120 click unidirectional stainless steel bezel with a very well marked metal dive insert and a lume pip. The machined edge of the bezel tapers down from the slightly domed, raised sapphire crystal. 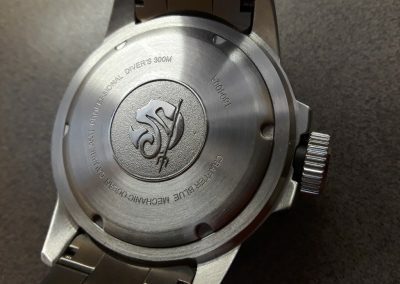 The well finished brushed stainless screw down case back combines a center design of a mermaid warrior with the right amount of watch information circling the case back. All eleven indices on the face of each watch are white with well done chrome or black surrounds and are just the right proportion to match the tapered hour and minute hands and the lollipop second hand. The 3 o’clock white on black date window is not intrusive. Lume is excellent. The slightly tapered hands have either chrome or black surrounds to match the watch indices. 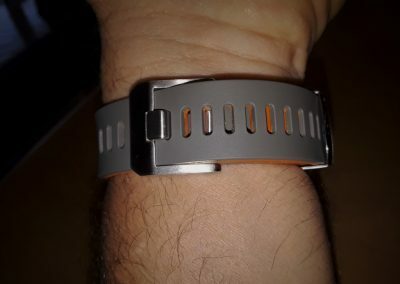 The white or black 60 second/minute markers fill the edge of the face correctly and the type style and font used on the watch face is spot on. 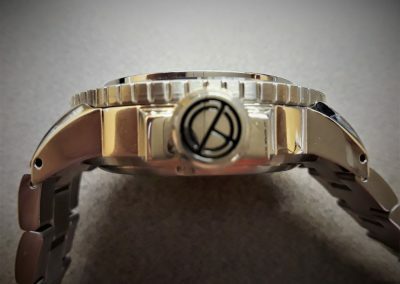 I would prefer to see the watch with no duplication of wording with the engravings on the inner bezel, which would remove the last two lines from the lower half of the watch face. Both the stainless steel bracelet and vulcanized rubber straps used on these watches are superb, in my opinion. The stainless steel bracelet combines a conventional, micro adjustable push button release, with a modern Rolex Submariner type clasp. 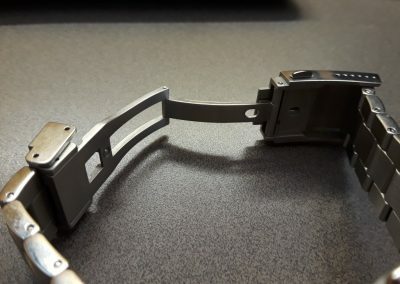 The machine work on the clasp, the bracelet and the folding links is superb. The bicolor, vulcanized rubber strap is very soft and comfortable, and it tapers from 22mm to 20 mm. 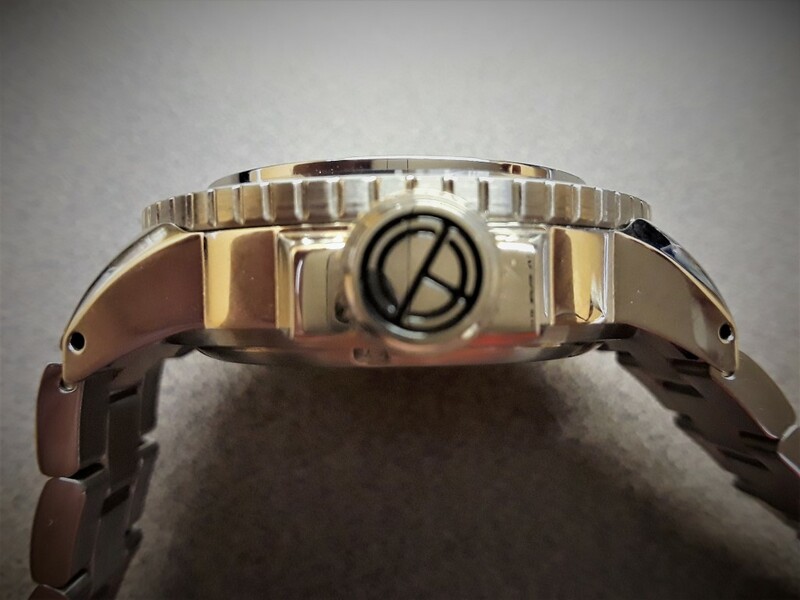 It is combined with 15 round cornered, rectangular adjustment holes with a well finished, brushed stainless steel buckle and signed stainless steel loop that keeps the watch strap close to the wrist without ever being too tight or loose. 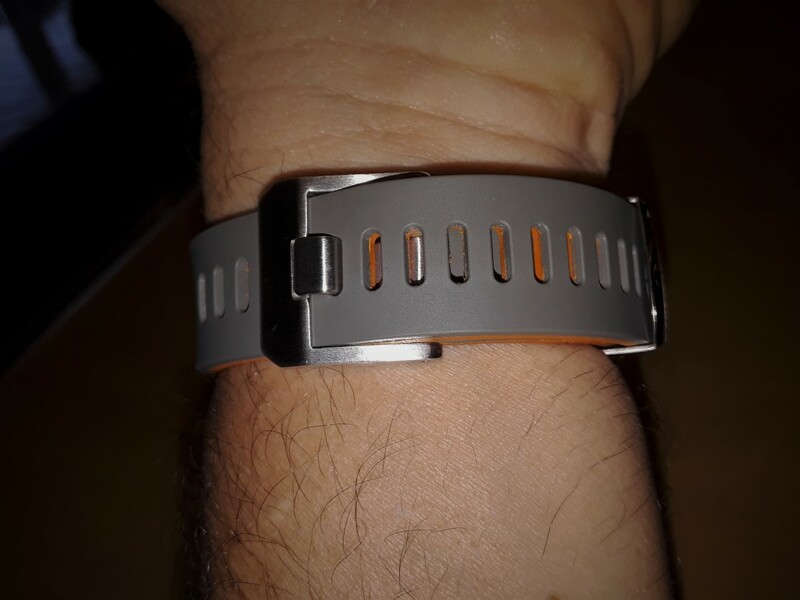 The bracelet model also hugs the wrist well, considering its size. 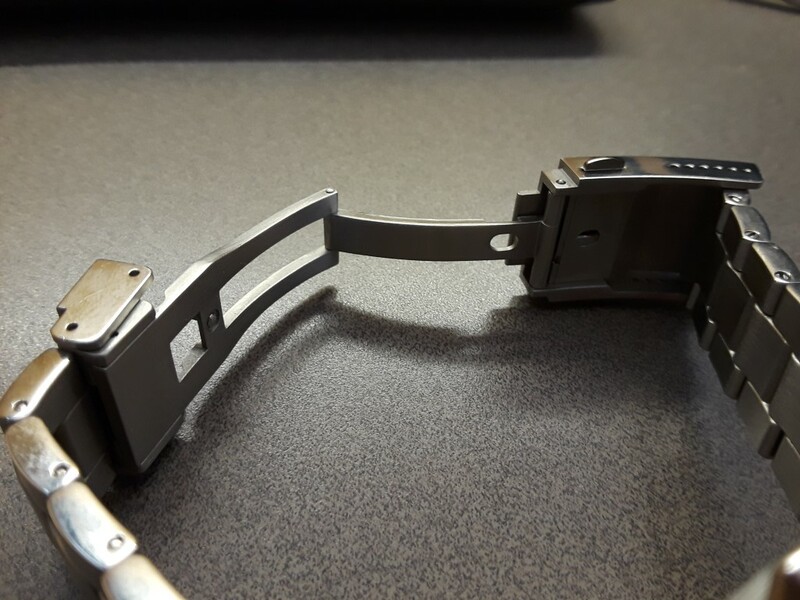 Incidentally, the lugs of these watches are drilled, and the vulcanized rubber strap has a nicely moulded diagonal pattern on the inside of the strap that helps keep it from sliding on the wrist.